In a futuristic city named Neo-Detroit, a scientist named Jeed kidnaps two police officers, Maxima and Rocky, and transforms them into cyborgs, but failed to implant on them a chip that would make them obey his will. They eventually escape his grasp and decide to defeat the mad scientist. He pits his army against the two, but they are no match for Maxima and Rocky. Maxima and Rocky eventually find out that Jeed kidnapped his own daughter to prevent her from stopping him. Maxima and Rocky defeated Jeed and saved his daughter. In gratitude for rescuing her, she returned them to normal. 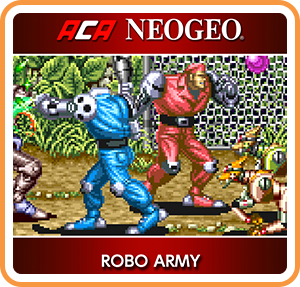 Where can I buy ACA NEOGEO ROBO ARMY physical/digital?